Shopping for Wonder Woman Statues? Wonder Woman trades in her invisible jet! Diana Prince leans on her "invisible motorcycle." Check out her arm tattoos and stylish motorcycle jacket! Beautiful statue measures about 15-inches wide x 10 1/2-inches tall x 8-inches deep. It appears that Princess Diana of Themyscira has tired of jetting around the planet and decided to try the thrills that come with a motorcycle instead. 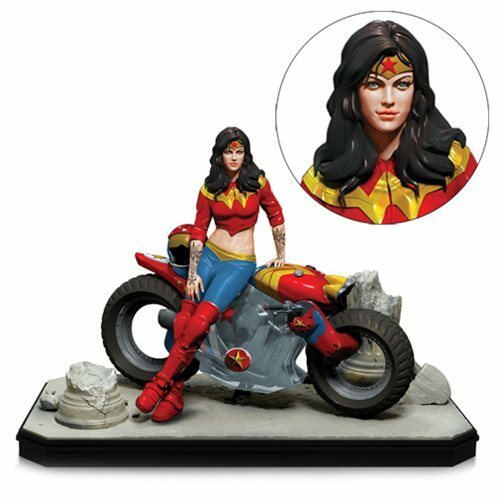 Hence, this 15-inch wide x 10 1/2-inch tall x 8-inch deep Gotham City Garage Wonder Woman Statue featuring a grease-monkey take on Diana Prince. Leaning on her "invisible motorcycle," the beautiful Amazonian Princess sports some arm tattoos and a stylish motorcycle jacket. Take her for a spin!